Petro Poroshenko has engaged the French publicist Bernard-Henri Levy to give the last days of the Ukrainian presidential election campaign a classical gloss, with Herculean notes. During the war of August 2008 Levy had tried the same thing for the Georgian President Mikheil Sakaashvili, but the gods were unpersuaded. In inviting Levy along for last weekend’s campaign swing in eastern Ukraine, Poroshenko cannot have been thinking of the local voters. They, the latest Kiev poll makes clear, aren’t thinking of him. 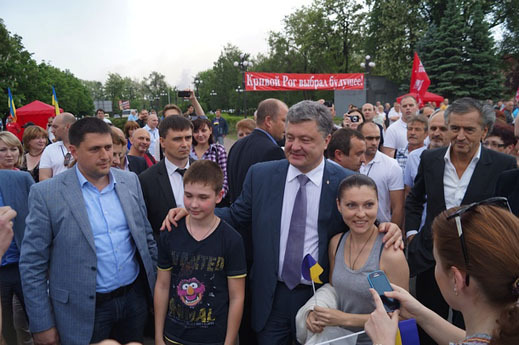 Interviewing through May 11 by the Kyiv International Institute for Sociology (KIIS) reveals that Poroshenko is headed for a first-round majority in the western and central regions of the country. Counting countrywide those who say they will vote, Poroshenko had 54.7%. 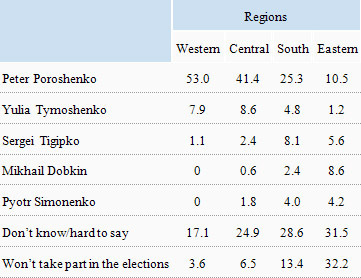 Yulia Tymoshenko was a distant second with 9.6%; she has been losing ground as the campaign has advanced. The four names with a following east of the Dnieper River had a combined 15.4% in the May 11 poll: Sergei Tigipko, 6.7%; Mikhail Dobkin, 4.3%; Pyotr Simonenko, 3.9%; and Oleg Tsarev, 0.5%. Since the KIIS poll was completed, Simonenko, the Communist Party candidate, has withdrawn. Tsarev, who has sided with the Lugansk and Donetsk separatists, has also cancelled. In the east the sentiment against voting in the election is stronger than support for these candidates, and it is growing, according to the KIIS poll data. By next Sunday, it is now likely that more than 50% of voters in the eastern regions of Kharkov, Donetsk and Lugansk will boycott the election. On the all-Ukraine register of voters, those eligible to vote in these regions make up 22% of the country total. 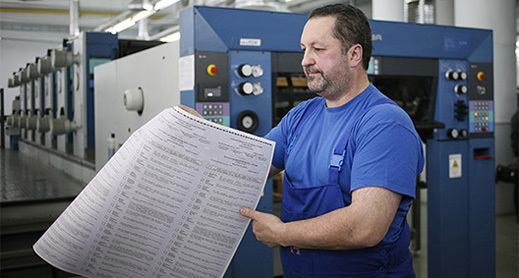 In the southeastern regions, which KIIS calls southern in its tabulations and counts as Dniepropetrovsk, Zaporizhiye, Odessa, Nikolaev, and Kherson, about one-third will not vote. These regions comprise 23% of the register. On paper, then, about half of half of the Ukrainian electorate is against the choice, and thus the outcome of the presidential election. KIIS reports it randomly sampled 2,022 eligible voters in 110 locations. The margin for error is no more than about 3%. The trend of Ukrainian voter opinion is also revealing. For reports of earlier KIIS voter surveys and comparable polls by US and Canadian Government-funded organizations, click. Beware of the non-comparability of the regional results of polls conducted by different organizations. The Razumkov Centre polling, for example, has counted Dniepropetrovsk and Zaporizhiye in the east, while KIIS counts them less conventionally in the south. The US Government polling by the International Republic Institute has avoided publishing the regional voter breakdown data since March, but that month it counted Dniepropetrovsk in the east, Zaporozhiye in the south. Notwithstanding the regional counting differences, it is clear that among the Don’t-Knows and the No-voters, the events between the Razumkov poll of April 29 and the KIIS poll of May 11 have not encouraged regional voters to participate in the presidential race. Among eastern and southern voters willing to cast ballots for Poroshenko, the turn of events appears to have turned more of them against him. By April 29 – three days before the lethal Odessa fire on May 2 – 28.4% of southerners said they didn’t know whether they would vote; 16.7% said they would not. By May 11 — after the fire and also after the fatal shootings in Mariupol (Donetsk region) on May 10 — support for the vote boycott had grown. In the south, according to KIIS, the No-voters were 28.6%; the Don’t-knows, 13.4%. In the eastern regions on May 11, the No-voters and the Don’t-Knows were more numerous at 32.2%. and 31.5%, respectively. If there is one last poll before election day on May 25 it is almost certain the sentiment will have hardened further, and not in Poroshenko’s favour. According to a report from the Ukrainian Central Election Commission in Kiev, published by the Atlantic Council of Washington, DC, the May 25 vote “may in some ways be the freest vote for a Ukrainian president since the country became independent 22 year ago.” The reason, according to Andriy Mahera, deputy chairman of the Commission, is that there is no incumbent on the 21-name ballot paper. “In 2014 we don’t have the element of the so-called administrative resource, with government structures being used to coerce voters to support the official, chosen candidate,” Mahera said. [*] For the history of Hercules as a pyschopath, see Alastair Blanshard, Hercules, A Heroic Life (London 2005). The painting is Hercules and Omphale by Peter Paul Rubens (1605). The original is in the Louvre; this one hangs in Washington. Clockwise from left: Chancellor Angela Merkel; President Barack Obama; OSCE Chief Didier Burkhalter; President Barack Obama; Poroshenko; Assistant Secretary of State Victoria Nuland.